A Qt for Embedded Linux application requires a server application to be running, or to be the server application itself. Any Qt for Embedded Linux application can be the server application by constructing the QApplication object with the QApplication::GuiServer type, or by running the application with the -qws command line option. Applications can run using both single and multiple displays, and various command line options are available. Provided that the environment variables are adjusted properly during the installation process, you should see the Text Edit demo appear. Additional applications can be run as clients, i.e., by running these applications without the -qws option they will connect to the existing server as clients. You can exit the server application at any time using Ctrl+Alt+Backspace. Qt for Embedded Linux also allows multiple displays to be used simultaneously. There are two ways of achieving this: Either run multiple Qt for Embedded Linux server processes, or use the ready-made Multi screen driver. There is no way of moving a client from one display to another when running multiple server processes. Using the Multi screen driver, on the other hand, applications can easiliy be moved between the various screens. See the display management documentation for details regarding arguments. The font should be specified using an X logical font description. The color-name must be one of the names recognized by the QColor constructor. See also: Qt for Embedded Linux Character Input. -mouse Enables the mouse cursor. See also: Qt for Embedded Linux Pointer Handling. -nomouse Disables the mouse cursor. -qws Runs the application as a server application, i.e. constructs a QApplication object of the QApplication::GuiServer type. -display Specifies the screen driver. See also: Qt for Embedded Linux Display Management. 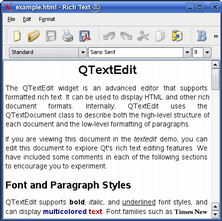 The supported styles are windows, default and styled.